Apparently identical, these two pieces of Clay Red French Profile tile were made in different plants owned by Ludowici Celadon in the 1940’s, New Lexington, Ohio and Coffeyville, Kansas, respectively. Careful examination of this photograph will reveal numerous differences in the width of channels and ribs sufficient to prevent the installation of any volume of one into the other. Individual tiles may be made to fit, but larger patches will “creep” considerably. Additionally, the Ohio tile is noticeably redder, the clay that produced it having originated from a different clay bed. Diligent confirmation of the compatibility of replacement tile can help to assure the success of your project. 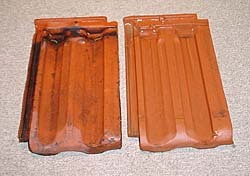 Salvaged Ludowici roof tile sets the standard for period replacement roof tile. Ludowici Tile is still produced in their original plant, in southern Ohio, but to get good salvaged tile, we go to Mickey Miller, Sales and Technical Consultant for the Roof Tile and Slate Company. The Roof Tile and Slate Company has over a thousand squares of Ludowici roof tile at their yard in Carrollton, Texas. It would seem that as a manufactured product, it should be easier to match roof tile than roofing slate. Tile is tile, right? Unfortunately, according to Mickey Miller, it is not. Like slate, tile clay is a natural masonry material whose appearance is peculiar to the location in which it was dug, but unlike slate, the character of tile is decided in the manufacturing process. High durability is achieved by a finer screening of the clay and higher firing temperatures all of which serve to create a fully fused, non-porous, longer lasting material. This is most critical in any environment exposed to cycles of freezing and thawing. Consistent adherence to high standards over the years has earned the Ludowici brand recognition as the U.S. standard and thus the model for imitation going back many decades. Salvaged Ludowici therefore demands a higher price than salvaged off brands and even most new imports. With such a well recognized industry standard, there seems reason to hope that copycat salvaged roof tile would be interchangeable. Not necessarily. Ludowici will rarely lock up with tile of its many defunct imitators. To further complicate the matter, tile from any one of the many plants Ludowici formerly operated won’t necessarily fit tile from any other and will certainly not fit the tile which they are manufacturing today which is 3/8″ smaller overall. As a result, the buyer must be particular when seeking units for “patches”, but can consider a wider range of options when replacing entire roof planes where interlocking compatibility to existing tile isn’t relevant. List of Roof Tile Matching Specialists. This entry was posted in Roof Restoration and tagged Ohio, Roofing Slate and Tile, Texas. Bookmark the permalink.